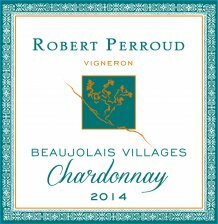 Robert Perroud’s family has been a vigneron for seven generations. His estate dates back to 1789 during the French Revolution. Robert has been in Brouilly since he was a baby. His father taught him great values, including the love of work well done. The estate is located in « Les Balloquets » at the foot of Brouilly where he lives with his family in a bioclimatic house surronded by vineyards, in a universe of work and life. The gamay noir plots have a mostly soth, southeast exposure protected by the hills from the north wind. The vines are located on a very steep slopes, around 40%. The soil is not very deep, yields are naturally limited to 50 centiliters of wine per vine. The soil is made of red granite, iron minerals, and sand. All the work in the vines is done by hand. He likes to feel in harmony with the nature, taking the time to observe and developp the biodiversity in the vines, practising a sustanable – ecofriendly – wine growing. In the estate, only two persons to work in the vines : Robert and his assistant, Frédéric. They know by heart each vine of the estate. A lot of efforts in the vines are made in order to get qualitative grapes : good grapes are the basis of a good wine. All the grapes are picked up by hands in red cases of 50 kgs like his father was doing in the 60’s. The winemaking is made with full grapes, so very traditionnaly. It is the typical method in Beaujolais called carbonic maceration. The skills of a good winemaker is only to frame (encadrer) the nature but not trying to manage or change it. The ageing takes place in wooden vats or barrels, the bottling is made by hand on the estate. He produces only estate grown wine. 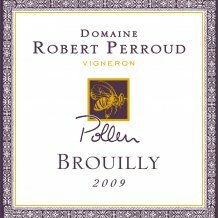 This wine is the perfect example of a Brouilly, typical of the terroir and hillsides. Beautifully deep robe – the nose gives off in succession mineral, woodland and blackberry notes. The mouth is ample, rich, of great finesse: the epitome of the best grapes harvested at their ripest. Good length on vanilla notes. A wine with a unique personality and Burgundy. Traditionally paired with grilled meat and cheese. Serve at 15°C. 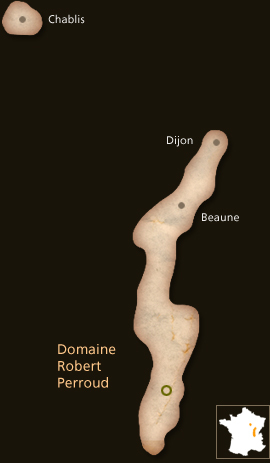 Soil and Vineyard: Plots situated at the lieu dit “Les Saburins”, sandy and granitic soil, presence of amethyst rock. 300 meters high. With a South East exposure on a 40% slope. A very tiny plot of around 0.80 Ha. High plantation density of 11,000 ft/Ha. 80 years old vines. Farming and Winemaking: Robert is completely passionate about cultivating vines and winemaking. He loves speaking about his “art and wine,” coming from his unique terroir in Brouilly and Cote de Brouilly, giving thanks to its unique character which he contributes to the complexity and richness of his wines. Robert honors his vineyards natural complexities and ecology by practicing reasonable and sustainable winegrowing techniques. In the spring he practices the “green harvest” as it is called which favors quality not quantity and encourages ripeness and concentration in the young grapes by decreasing the yield. This is all done by hand, and come autumn the harvest is also done manually and collected in small containers weighing on average, 45 kgs, in order to conserve the delicate Gamay grapes. The next steps are composed of vatting the grapes for a minimum of 10 days, ageing for 12 months in old oak barrels from Auxey-Duresse in Côte d’Or and estate bottled in traditional Burgundy bottles with natural corks. Beautiful yellow golden robe. A nose displaying white flower, almond, green apple and citrusy notes. In the palate, the wine is fruity, fresh, and slightly buttery with some mineral and smoky notes. Pair well with goat cheese, seafood, fish, and salad! Soil and Vineyard: Small plot located in the lieu-dit “Saint-Vincent” in Quincie-en-Beaujolais near the Cru Brouilly with Southern East exposure. Soil composed of clay and granitic sand. 280 meter elevation. Farming and Winemaking: High training on canope, working the soil, harvested by hands in small crates, grapes directly pressed at arrival in the cellar, fermentation under native yeasts, partial aging in barrels and stainless steel vats on lees for 6 months.